This is a capelet (meaning short cape), and comes to a few inches below the shoulder, so is perfect to keep the shoulders warm when wearing sleeveless/strapless dresses on those slightly cooler spring/autumn nights. 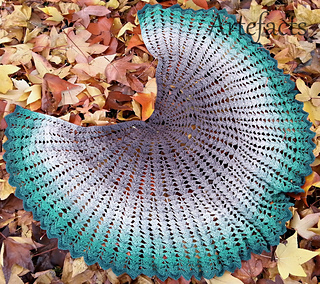 I tried to use up as much of the Scheepjes Whirl cake as I could, which is why it is the size it is! You could use any equivalent weight yarn as a substitute, although it will probably work with thicker yarn and a correspondingly-sized hook (and work up much faster!). 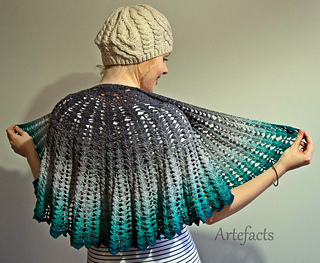 I would love to see photos of your completed capelets, no matter what yarn you use. If you use the pattern and come across any problems/mistakes, I’d appreciate it if you could let me know, so we can fix it together. Please don’t rate it unless and until any problems have been addressed and you have finished your capelet. Thanks :-).